The Chinese characters for Tai Chi Chuancan be translated as the 'Supreme Ultimate Force'. The notion of 'supreme ultimate' is often associated with the Chinese concept of yin-yang, the notion that one can see a dynamic duality (male/female, active/passive, dark/light, forceful/yielding, etc.) in all things. 'Force' (or, more literally, 'fist') can be thought of here as the means or way of achieving this ying-yang, or 'supreme-ultimate' discipline. Tai Chi, as it is practiced in the west today, can perhaps best be thought of as a moving form of yoga and meditation combined. There are a number of so- called forms(sometimes also called 'sets') which consist of a sequence of movements. Many of these movements are originally derived from the martial arts (and perhaps even more ancestrally than that, from the natural movements of animals and birds) although the way they are performed in Tai Chi is slowly, softly and gracefully with smooth and even transitions between them. For many practicioners the focus in doing them is not, first and foremost, martial, but as a meditative exercise for the body. 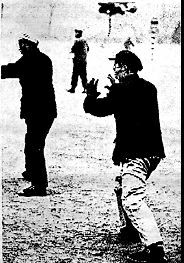 For others the combataspects of Tai Chi are of considerable interest. In Chinese philosophy and medicine there exists the concept of 'chi', a vital force that animates the body. One of the avowed aims of Tai Chi is to foster the circulation of this 'chi' within the body, the belief being that by doing so the health and vitality of the person are enhanced. This 'chi' circulates in patterns that are close related to the nervous and vascular system and thus the notion is closely connected with that of the practice of acupuncture and other oriental healing arts. The practical exercises of Tai Chi are also situated in a wider philosophical context of Taoism. This is a reflective, mystical Chinese tradition first associated with the scholar and mystic Lao Tsu, an older contemporary of Confucius. He wrote and taught in the province of Honan in the 6th century B.C. and authored the seminal work of Taoism, the Tao Te Ching. As a philosophy, Taoism has many elements but fundamentally it espouses a calm, reflective and mystic view of the world steeped in the beauty and tranquillity of nature.